Make your residential or commercial property in W6 more presentable by arranging an appointment for our trusted window cleaning services! We are a long-standing cleaning services provider and keep track of the latest trends in the window cleaning trade. Thus, we have adopted an innovative approach which enables us to clean customers’ windows from the safety of the ground, using modern telescopic poles and purified water. The final results are outstanding – spotless, streak-free windows that will add a greater curb appeal to your home or office. If willing to book us, you can do so by leaving your details in our online service form! Gone are the days when cleaners had to utilise a ladder to reach hard-to-access upper-floor windows. 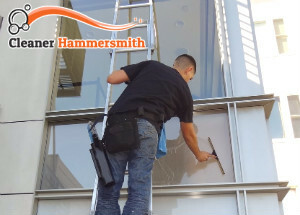 Our company’s innovative approach allows our cleaners to clean customers’ windows from ground level as we have invested in advanced water-fed poles which extend to up to 30 feet. Thus, you don’t have to worry we would spoil your flowerbeds or dent your windowsills. Yet another advantage of our approach results from the fact we use nothing but purified water in the cleaning process. The results are spotless window panes without a single smear or streak. Customers will greatly benefit from our regular window cleaning packages which are available at discounted prices. Our reliable and insured team can drop by to clean your windows on a weekly, biweekly or monthly basis, depending on your individual requirements. 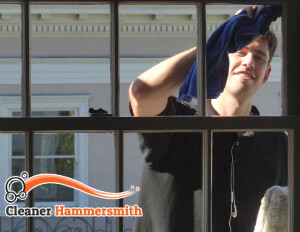 Everyone who books our window cleaning services in Hammersmith, W6 is eligible for a zero-obligation quote as we aim to maintain the excellent reputation we enjoy in the area and wish to keep it honest with our customers when it comes to pricing. Contact us today to request your free quote and have your windows cleaned to perfection! Copyright © 2019 Cleaner Hammersmith. All Rights Reserved.